So excited because today is my birthday!!! I turn the big 29 today: my last year of my 20's. Honestly, time has flown by but I'm not complaining because you know what they say....time flies when you're having fun (who even said that to begin with?! I don't know but it's actually genius because it is SO true). 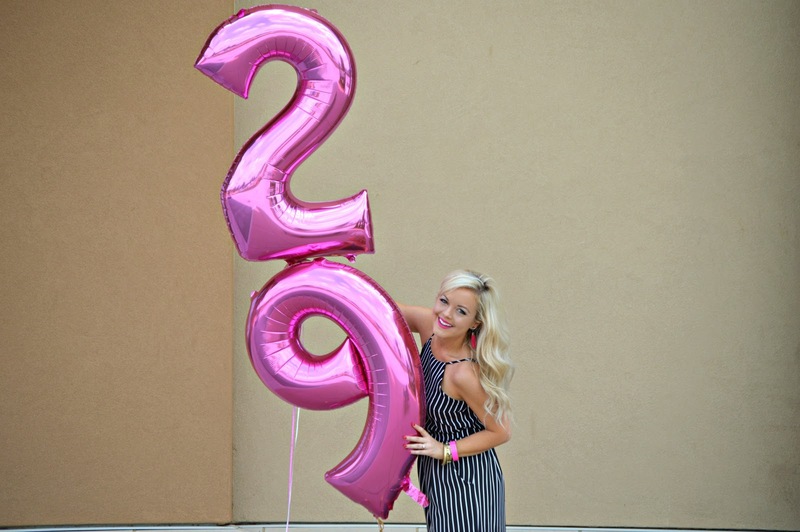 Also, doesn't every girl need to have a photoshoot with giant hot pink balloons!? Let me tell y'all about this outfit too...when I saw this jumpsuit I knew I had to have it. It reminded me of the TopShop one from the NSale that I loved. I found this one last weekend at Dillard's, and get this: it' is under $40! This was my first culotte jumpsuit and I have to say I'm now officially obsessed because it's such a great twist on a romper, and just as wearing a dress. Not to mention, it is SUCH a comfy outfit! 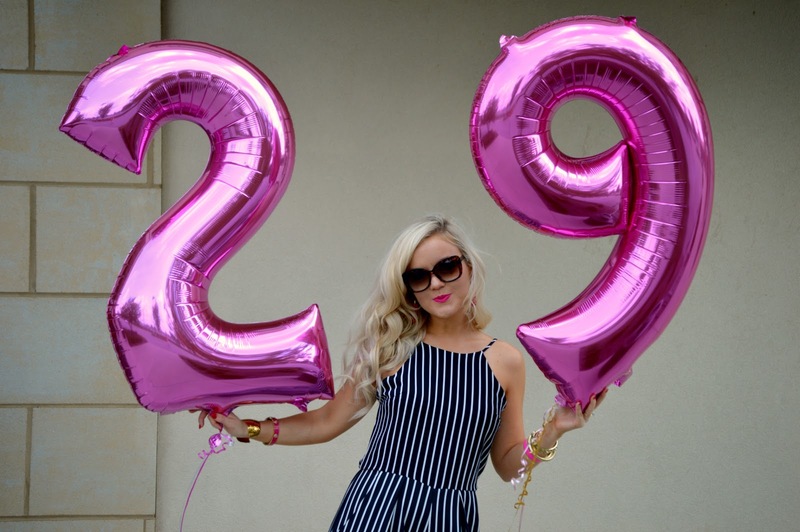 To bring out the pink in the balloons, I accessorized with hot pink lipstick + accessories. This is my ideal birthday #ootn. Soooooo as I sit here and reflect on my life (yep, I'm about to get deep y'all), I want to share 29 Pearls of Wisdom I have learned in my 29 years of life so far! 1. Never settle. Never, ever, ever, ever! Go for what you want in life and work tirelessly until you achieve it! However, realize most things in life do not happen over night. They require hard work, time and PATIENCE. 2. Do not be defined by 1 role or stereotype. You can be a woman of power and strength (Shoutout to my middle & high school GPS, Girls Preparatory School....who always had the motto: "girls with power and strength")! Yes, you can LOVE science and LOVE fashion. You can dress up but also study and work hard. You can be funny but also intelligent. The list goes on and on. Don't be limited to live up to your utmost potential. 3. Spend time in the Word. I have learned throughout my life how important it is to just open your Bible and read! There is scripture to be found for every season of life. It is so amazing how God speaks to us through his Word. Who says you can't do it if you never try?? Apply to your dream college or for your dream job. 5. Do not fret if you don't have it all "figured out" as a freshman in college, or a senior in high school, or even after you've graduated college. Don't fret if you don't have it all figured out by the time you're 18, 22, 26, or even 29. I always knew in my heart of hearts I wanted to work in the medical field as a primary care provider, when my love of science blossomed beginning in the 6th grade (and I highly thank my GPS all girls school education for helping nourish this love from 7th-12th grade). To make a long story short, I graduated UTK with a Bachelor's degree in Microbiology, but through lots of prayer and seeking God's will for my life, decided that my role in the medical field should be as a Nurse Practitioner. So, first step, going back to UTC and earning my bachelor's degree in nursing. Next step, before I had graduated nursing school, applying to Vanderbilt's Family Nurse Practitioner program, and being accepted!! This took me time to figure out God's will for my life. It was worth the wait! I have to say that this is the ONE pearl of wisdom that has helped me through countless events in my life...stressful events, anxiety filled events, sorrow, etc. I have been blessed that my Mom, Dad, and grandparents all taught me that my faith in God is the most important aspect of my life. Through my faith, I have learned that praying no matter my circumstance has lead to many doors opening (and closing), but no matter what, I have seen God's will in my life by asking Him through prayer to show me His way. 7. Treasure time with your loved ones. Two of my precious grandparents passed away in 2008 and 2009. I know that they are in a much better, happier place; but I would be lying if I said that I don't sometimes wish they were around so that I could have just one more meal with them, hear my Daddy Jack's laugh one more time, or give my Mamaw a huge hug and kiss, and so that they both could have met my hubby (because I know they both would have LOVED him). All of that being said, I have learned how important it is to truly treasure and take advantage of the time you have with your loved ones. Pick up the phone and call your Mom (for me this is no issue because I think I may call my Mom 20 times a day lol but you get the idea). Go on a dinner date with your Dad. Have a sleepover with your Nana (I'm SO fortunate to still have my Nana around and that she is in such good health. I spent many summers in college going over to have a sleepover with her during my time at home). Invite your nephews over for a pizza party. You won't ever regret spending time with your loved ones!!! 8. Don't marry someone just to get married. I repeat: DO NOT marry someone just to get married. Take time to marry the Prince Charming who God prepared for you! Trust me, it is MORE than worth the wait. Without going into too much detail, I will just say that waiting on the Lord is always the best option and He will bless you! I thank the Lord every single day for the husband He prepared for me. I love you KT!!!! 9. Sometimes your timetable may not be God's timetable, but God's plans are the best. See #5 and #8. Trust God's timing! He can see the big picture that we as humans can't. Which also reminds me of this verse: Romans 8:28 "And we know that in all things God works for the good of those who love Him, who have been called according to His purpose." You are worth it, girl! Don't ever let anyone make you think otherwise. God created you in His image (Genesis 1:27), and He has a purpose for your life (Jeremiah 29:11). Don't believe anyone who makes you feel any other way! "No one can make you feel inferior without your consent" -Eleanor Roosevelt. 11. "Always stay sweet and good on the inside too-and you will have the world by the tail." These words were written in a precious letter to me by my Mamaw. This is literally some of THE best advice I have ever received. Always be kind to everyone!! Be appreciative and do not "expect" anything. For example...just because you're the bride does not mean you can be bridezilla and everyone has to do exactly what you say "because it's your day." BE KIND to these people who you call your friends and appreciate every effort they are making to be there for you on your special day! 12. Study hard in school and work hard in life. Do your best. Colossians 3:23 "Whatever you do, work at it with all your heart, as working for the Lord." My parents have always been excellent examples of working hard and doing your best no matter what it is they were doing (being husband/wife, being parents, working at their own business)! Also, Mom always taught me to do my best. "Just do your best" (she still texts me this even now as I am studying and preparing for my boards). This is a lesson I will carry with me the rest of my life. 13. Know when to say "no" and don't pile too much on your plate. Sometimes it can be easy to spread yourself too thin and give too much of yourself to too many people. Set your priorities in your life, and stick to those. It's ok to say no to make sure that you take care of your top priorities first. 14. Invest time in giving back to others. As I have finally finished school, I am so looking forward to finding a place to volunteer in my free time. There is so much value in giving, and there is so much opportunity out there in our community to do so! 15. Worry is a big thief of joy, and besides, why worry because oftentimes you're stronger than you give yourself credit for (thanks to God)! "Don't worry, be happy!" So, confession. I tend to worry....sometimes a lot. Especially when there is uncertainty in life, which, let's face it, I'm pretty sure the definition of "living" = uncertainty. Worrying definitely can rob you of joy, so instead of worrying, I try to have faith and pray about my fears. Then I am reminded of all the times that God has brought me through trying times in life through trusting in Him. So, why worry? Matthew 6:33-34: "But seek first His kingdom and His righteousness, and all these things will be given to you as well. Therefore do not worry about tomorrow, for tomorrow will worry about itself. Each day has enough trouble of its own." 16. Listen to the wisdom of those who have gone before you. My Mom literally has THE best, most practical, and just seemingly perfect advice no matter what I'm calling about (oh yeah, have I mentioned I call my Mom like 20 times a day? haha!). She has "been there, done that," so to speak, and her advice no matter what stage of life I'm in has ALWAYS been spot on. Take advantage of those around you who have had many life experiences! They are full of wisdom that you can carry with you when you just don't know what to do about a certain situation. 17. Make your family your top priority. God gave you 1 family, treasure them and love them with all your being! Spend time with them above others. Be there for them no matter day or night. Help them when they need help. Love them when they need love. Encourage them, support them. Give them good advice when they need it!!! 18. Floor nursing is not for everyone but the experience it gives you is irreplaceable. God bless floor nurses!!!! Trust me when I say it is 100% one of the hardest jobs on planet Earth. It is an honor and a privilege to care for others in any capacity in the medical field. As a nurse, you witness a wide array of emotions, emergencies, and struggles that are indescribable unless if you've been there. So as a previous floor nurse, I have to say that I have the absolute utmost respect for my fellow nurses, and I am SO thankful for the amazing experiences it provided me in my career! 19. Sometimes people can be mean, but this does not define you. When I say it does not define you when people are mean, I am just saying that it does not make up who you are as a person. It is someone's opinion, and that's it. Smile, nod, and don't dwell on it (yes I know, easier said than done right?). There's no better time than the present! Stop saying "tomorrow" and switch your vocabulary to "today." I'm still working on this one, but as I continue into my last year of my 20's, I will definitely strive to do this every day. Here's the truth: water is not my favorite drink. I may or may not really like Diet Coke. HOWEVER, guess what doesn't like Diet Coke? My kidneys. Or any of my other organs. I am not here to give medical advice, but in my life so far and the things I have seen in the medical world....I have learned how important it is to drink water and lots of it! 22. "Book the plane ticket and go!" This summer, my Aunt Melissa gave my husband and me some of the most AMAZING advice. She said, "When many people travel, they have this idea that they are never going to go back to that place, so they feel the pressure to do everything all at once. They see 5 countries in Europe instead of taking a trip just to see one. Do not have the mentality that you will never be back there. Instead, ENJOY and SAVOR where you are. Spend time to fully live it up and know that you WILL be back. Just book the plane ticket and go!" 23. Go to concerts and lots of them! Oh and, sing & dance your heart out! 24. Never lose the magic. Never be afraid of what others will think of you. 25. Pay your dues. No one owes you anything in life. I am a firm believer that being entitled is just not a good way to be! Never expect that anyone "owes" you something. Be willing to put your time in and "pay your dues" so to speak. This takes time, hard work, faith and prayer. 26. The biggest compliment I could ever receive in life that is I am like my parents. Talk about hashtag GOALS. I have learned through my parents and their amazing love, support, and endless encouragement of me and my dreams, that I want to be the EXACT same way with our future children one day. What's more is not only are they kind, giving, and supportive, but they also work HARD for what they want in life! I have so much inspiration to aim for in my life! 27. Have girl time with your friends. Shopping and road trips are 2 things you'll never regret. The summer of 2014 is one I will never forget. My best friends and I went on 2 different beach trips to 2 different concerts (Kenny Chesney and Kip Moore), literally a mere month apart. Take advantage of these times during your life when you can just get up and go! I realize that this is not a practical thing for everyone at every stage of their life (even for me now, I wouldn't be able to take this time off!). However, looking back I am SO grateful I had this time with my girlfriends. Even now, I love being able to meet friends for lunch and a shopping day. Take the time to do this when you can, it is SO refreshing to reconnect with your besties! 28. Be prepared & buy an agenda! Make checklists, set goals for yourself, and get busy checking things off! I don't know about you but I LOVE me a cute agenda! Also, I love being organized and trying to accomplish things off of my to do list. Sometimes when you write the list down at first, it seems overwhelming to say the least. But I have learned that instead of being overwhelmed, start with #1, and before you know it you will have the first item checked off. Repeat this until you've accomplished all you have on your to do list. My Mom always told me (here she is with her great advice! ), "don't look at the big picture, just start with the first thing." 29. Embrace and enjoy the age you are! I'll be honest with y'all, I think it's sad the way our society views aging. Also, confession: I used to be sort of embarrassed that I'm almost 30. I have decided that this is just sort of ridiculous and that I should embrace it. My Mom has also told me her 30s and her 40s were the BEST years of her life. Well, all I have to say to that is, bring it on!!!!!! Thank y'all SO much for reading. I love you all!!! Have a wonderful Labor Day Weekend. P.S. 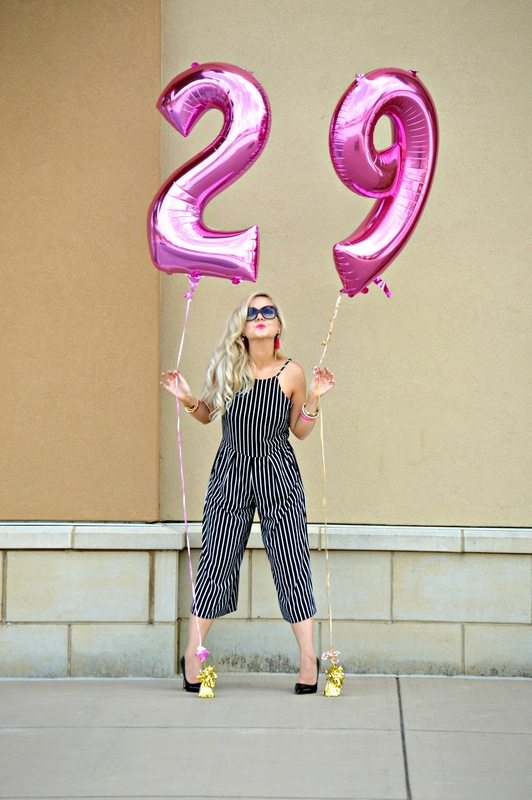 Check out the widget below to shop my look above and for some of my other current favorite culotte jumpsuits.